Reapfield says prices in the condominium market, excluding Mont’Kiara and KLCC, have not gone down and rental remains strong. 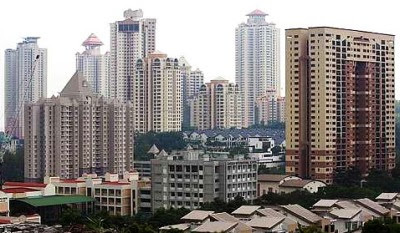 PETALING JAYA: The outlook of the property market is mixed, with developers reporting firm sales while property agents report tell-tale signs of a slowdown in certain market segments. “The quick and healthy take-up rates reported by developers mean that people are still confidently investing despite the seriousness of the US and European debt issues,” he said. “The market is not saturated. Although prices of landed units may have gone up quite a bit, it is possible to buy detached houses at RM1mil in Shah Alam,” he said. Senior vice-president Gerard Kho of real estate consultancy Reapfield, reckoned that the market might be rather flat when compared with the first half of this year and the whole of last year. The market during the last 18 months have been exceptionally buoyant and the full impact of the US-Europe problems were not factored in by the market then. “We are not sure what will happen in the second half of this year, but we are taking a cautious stand,” said Kho. He said the prices of landed units would continue to go but they are seeing a disparity between asking price and transacted price widening. This disparity was seen a couple of months ago, he said. Prices have gone up compared with the first half of this year but the increase was less. “We expect this situation to continue - growing disparity between asking and transacted price,” Kho said. As for the condominium market, excluding the KLCC and Mont' Kiara, prices have not gone down and rental remains strong. Kho said prices were flat in the Mont'Kiara and KLCC market. The company was also seeing more listings coming into the market which means there were more units available now and buyers were waiting on the sidelines looking for a good buy, he said. “But they are not going for fire-sale prices,” he said. “People today will be buying at more realistic prices, unlike the first half of this year when they were prepared to pay more than the current market prices. As more stocks entering the market, the market may soften but despite that, high-rise units costing less than RM500,000 are expected to do well. “If one is looking at the Klang Valley specifically, whether the market is up or down, there will be demand,” he said. Kho said in terms of market activities, the first half of this year was the most buoyant compared with the Jan-June 2009 and Jan-June 2010 periods. As for the healthy take-up rates, this may largely be attributed to the attractive lending terms offered by the banks together with the various rebates offered by developers. In a 23-acre development known as Empire City next to the Lebuhraya Damansara-Puchong (LDP) by the Empire Group, a marketing agent reported that sales have been brisk with five to six units sold on a daily basis about two weeks ago. Known as serviced office suites, the units are located on top of what will be a five-star hotel. “This enables the buyer to apply for a 90% loan because this project is on a commercial title. If it were a residential title, he can only get 70% loan, if this is his third mortgage,” the agent said. He explained that buyers need only pay a deposit of RM5,000. There is a 5% rebate. If a unit costs half a million, a buyer gets RM25,000 discount. He needs to pay the remaining 5% (RM25,000) upon signing the Sale and Purchase Agreement, less the RM5,000 booking fee. His initial capital outlay amounts to only RM20,000. The entire 23-acre development is expected to be completed by 2015. Rebates have become a feature in today's launches and may be a sign of the competitive property market, particularly for condominium sales. In a three-acre development in Jalan Kiara 3, near Mont'Kiara heading towards Segambut, Mitrajaya Homes group relaunched Kiara 9 Residency over the weekend. The completed project comprises about 200 units of condominiums and 16 units of 3.5 storey villas. The condominium block is 70% sold, the villas, 50% sold. There is a 20% rebate for condominium units facing west, those facing east, a 12% discount and those facing another upcoming condominium block, a 15% discount. Some of the discounts could go as high as RM200,000. Landed villas come with a 5% rebate. As an indication, a 2,200 sq ft unit complete with cabinet fixtures and electrical appliances on the 10th floor facing another ongoing block of high-rise apartment is priced at RM1.7mil, and a discount of up RM256,000 has been given.